I use aromatherapy sprays every day! I think I might be a bit addicted. It’s a great way to get the benefit of essential oils in an easy, convenient way. The lovely people at Bosisto’s have sent me their new Aromatherapy range of mists to try out. They have recently released three aromatherapy room mists – Sleep, Energy and Breathe. 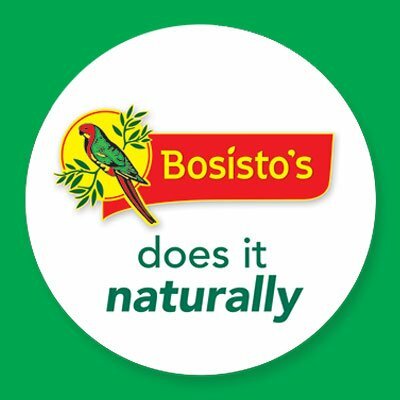 You might already be familiar with the Bosisto’s brand because their gorgeous eucalyptus oil with the parrot logo has been an Aussie institution since 1852! In fact, they are the oldest heritage brand that is still 100% Aussie owned and they know a thing or two about essential oils after being in the business so long. 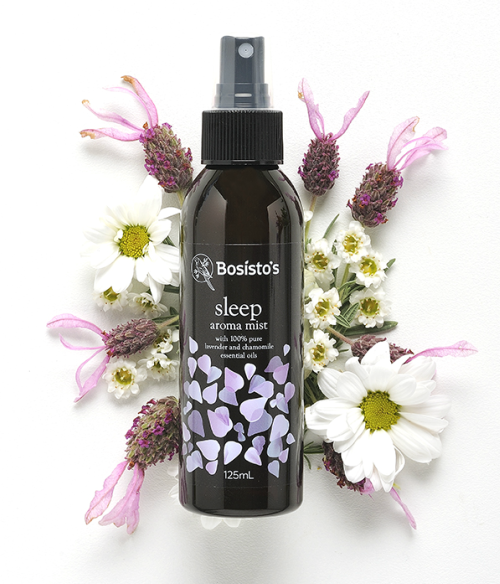 The Sleep Aroma Mist is a relaxing fusion of lavender and chamomile essential oils. Use it in your bedroom or on your pillow to help you get to unwind and get a better sleep at night. This one would also be great to calm down the kids if they are getting a little bit feral. Spray some around and change up the mood! Energy is a refreshing blend of rosemary, lemon and peppermint oils. Designed to be invigorating and energising, you can use this blend first thing in the morning to get going or if you are having a mid-afternoon slump! It would also be brilliant to spray around when the kids are doing their homework and need to focus. The Breathe Aroma Mist is great if you are feeling a bit under the weather. It has a zingy blend of eucalyptus, rosemary and wintergreen to clear the head. This one also works well as a spray for the sick room to freshen things up. So simple! Just pump 3-5 sprays into a room and use as often as needed. While essential oils are all natural, they still need to be used with caution. Spray into the room around you rather than towards you. As some essential oils are not suitable for pets, be mindful when spraying around your furry and feathered family. As well as the therapeutic benefits of aroma mists and their nice smell, I always find that spraying a room with oils changes the energy too. Without going to woo woo on you, they are a great way to cleanse any negative energy and change up the vibe. 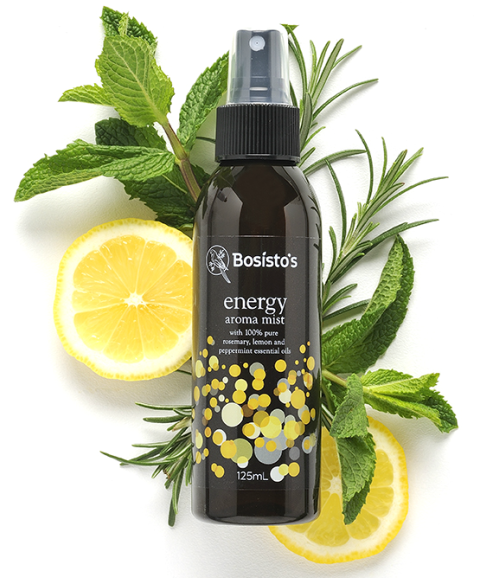 Bosisto’s only use 100% pure essential oils, water and ethanol in their aroma mists. There are no nasties like parabens, pthalates or synthetic fragrances. I think they are great! Not only are they very affordable, you can get them at most Woolworths, so they are easy to grab in your weekly shop. My family are loving them too – I could not find the Sleep mist anywhere when I wanted to take a photo. Turns out my daughter had ‘borrowed’ it to help her sleep and make her room smell nice! 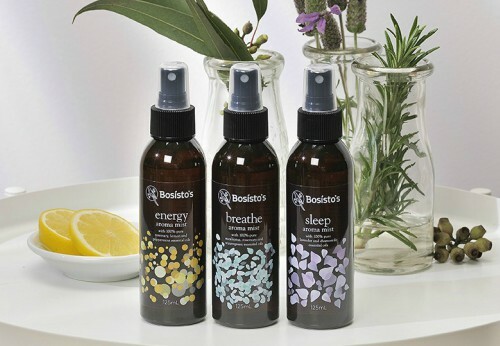 Bosisto’s aromatherapy mists are Aussie owned and made and never tested on animals. The spray bottles are also recyclable (or you could re-use them too). I am a long time essential oils lover and it’s great to see natural aromatherapy products coming into mainstream usage. You don’t need to spend a fortune to experience the benefits of pure aromatherapy oils. Bosisito’s have already done the blending for you, so you just need to spray and enjoy! 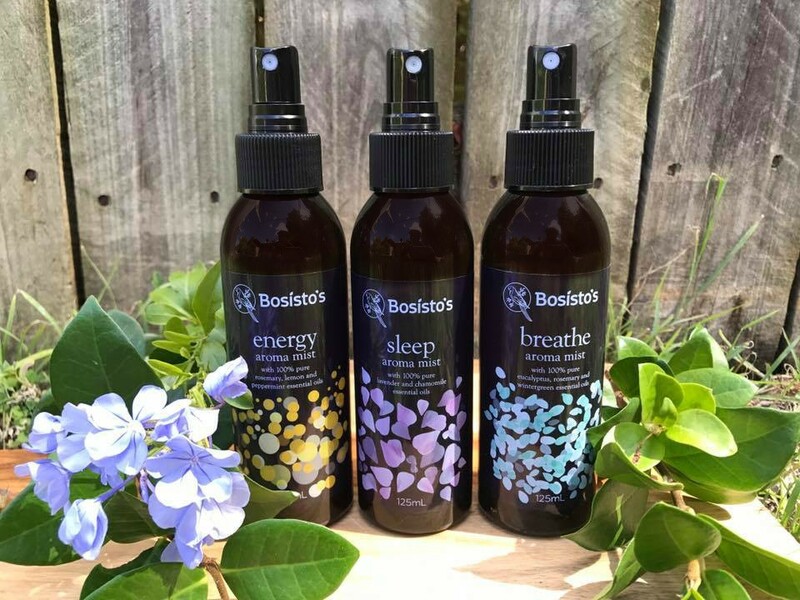 Most Woolworths stores stock the aromatherapy mists but Bosisto’s have their own online store where you can get them directly . If you shop at their online store, you can get 25% off until the end of February too! This giveaway has now closed. The lucky winners are: Tish, Lisa, Louise, Deborah and Debbie. The lovely people at Bosistos are giving away five packs of all three mists to five of you! Head to the Bosisto’s website and check out the sprays. Leave a comment here and let me know which one you are going to use first and what for. This giveaway ends 16th February at midnite (AEST). The winners will be chosen using a random number generator from those meeting the entry requirements and notified by email. Sorry, only those with an Australian address are eligible to enter. Good luck! These sound superb. I think I would try ENERGY first. These long, hot summer days do tend to sap the life out of us all. We could all use a touch more ENERGY. The Sleep Mist, because my son isn’t good at bed time, his mind kicks in at bedtime and he finds it hard to wind down. So this sounds like something we could use to help him get ready to snuggle down and go to sleep. I would definitely use breathe! I’m always saying it to myself, maybe a bit ofAromatherapy would help! The sleep spray. To help me nod off to perform with energy each and every day! Energy, who could not do with some extra zing in your life, love the smell of rosemary,lemon and peppermint, but never thought they would make a great blend for energy. I use Bosisto laundry powder, have done for years, so this is a lovely addition to their range. Most definitely Energy … its definitely needed ? The Sleep Mist, with a 6 month old I need all the help I can get! I would start with the Sleep aroma mist. I’ve got problems sleeping since surgery in my neck, and it would be great if it helped! I think the energy blend would be lovely to try, although it was a tough choice as all 3 would get a workout at my house! Post traumatic stress from an armed hold up and having flashbacks during the night due to insomnia is the pits. I think this would help me a lot. ? They sound wonderful! I would definitely try the Sleep most first as the summer heat is making sleep very difficult! I will definately be using the “sleep” spray in the kids room first! My 6yo struggles to fall asleep at night but is then tired in the morning and struggles to concentrate st school. It would be great to have something to help! Energy and Breathe for me with my autoimmune diseases and supporting my husband, and Sleep to help my husband who has been under Doctors and specialists for years with not getting more than 4-5 hours rest a night . If these work Bosisto’s, you will have business from everyone we know. I would definitely use the Sleep spray first- my 2 year old still wakes through the night & our 5 month old is very unsettled in the evenings!! Then I’d follow up with the Energy spray in the morning to give me a lift after the tiring nights!! I would definitely use Sleep first, to help me wind down before bed and get to sleep quicker! But Energy sounds great too, to give me a bit of a kickstart in the mornings when I struggle to wake up! These sound great, glad to know Woolies stocks them too. I am in desperate need of ENERGY to keep up with homeschooling our kids & being the local Girl Guide leader. Definitely the Sleep Aroma Mist; not just for bedtime but for setting kids down if they are a bit worked up. It sounds like a lovely, relaxing blend that the whole family can benefit from. I would love to try the BREATHE scented spray first. Having something calming but energising would help to create a peaceful, harmonious space in my home to bring my stress and anxiety levels down naturally. I’d use the energy blend first to “pep me up” in the afternoon. Straight from work, to picking the kids up from school & home to housework, dinner prep, afternoon sports & part time jobs. Hoping this will give me the lift I need to keep going until bed ? All three look wonderful and would each have a beneficial use in my home, but I would definitely try the SLEEP first to help relax me and put my mind to rest so that I can rest! I will use the energy one first. I have 3 boys and my oldest has ASD. Each day I am totally exhuasted so a burst of energy throughout the day would be fantastic. I would be using the Sleep Mist to calm my 2 boys down as they don’t stop! Also to help me sleep. I would use the energy spray because I would love a natural way to get an energy boost in the morning and after school with the kids. I would spray the Energy mist in my office in the afternoon, instead of having another caffeinated drink to get me through. I would go for the Sleep one first, shortly followed by the Energy spray. I have been suffering from insomnia for over 10 years so I’m keen to try anything to help unwind ans sleep. On the other hand it takes me a while to get going in the morning after a restless night so I would use the energizing one in the morning. The Breathe would be great during the flu season when the kids bring home some school germs. My boys share a room and it doesn’t get a lot of air flow so the breathe mist would live in there and I would def use it in the loo too!! ENERGY..to help motivate in the mornings before school and also post school for homework tackling. Energy- i am not a morning person so would love a bit of extra zing before work! Will be especially useful in the tent to wake me up at 5am for sled dog racing!! I’d love to use the energise one. With the family all returning back to school and work for the year, I’m finding we aren’t back into a good routine yet and everyone is slow starting in the morning. I think spraying the energise spray will helpget everyone a refreshing kick start to their day. I would say that the breathe would be the first one I would use. I am so busy as a sole parent and at times I find myself forgetting to breathe and take a moment just to ground myself. Sleep for the calming effects of lavender. Energy in the morning to kickstart us all then particularly for my son and I, the Sleep Mist would be awesome to switch us all off. Energy sounds great! First thing in the morning! I love their products, so whilst it is hard to choose. ..I would probably try sleep first. Not only for the obvious, but it would also be lovely to freshen the bedroom with. Making them so accessible to buy is revolutionary. I would use Energy to help me through the day. I would give my son Sleep as he struggles to doze off. Breathe would be for my daughter. The SLEEP spray would definitely help my 14 yr old son at night – he says he never sleeps through the night and finds it hard to wind down! We’ve tried everything! Looking forward to trying all of these! Always loved this brand. The sleep one will be used the most with the little ones I think. ? The SLEEP spray calls my name, because I am so tired of being so tired. I would use the sleep one first to help my teenage kids unwind. Hopefully it will ease them to sleep and put their devices away. Energy, that’s what I need for looking after my 3 kids. I will try the sleep aroma mitt first because being s shift worker, it would give me a restful sleep ?. Hi lovely. I will be trying the “Breathe” blend first. Having a child with severe PTSD, prone to daily nighttime explosions, I struggle to keep a clear head, and have lost my ability to be able to focus in the mornings, often waking exhausted & in pain. My obvious second choice will be the “Sleep” blend, to help calm my beautiful daughter when she is suffering from a really heightened episode. Breathe because at the moment I am using essential oils. Essential oils are indispensable. I place some drops on a tissue and breathe it in to soothe, aid in sleeping, relieve congestion and combat stale air. Energy – to help with witching hour! Breathe. For all the family as my little one are anxious about school beginnings . And I am about to start my prac and thesis. 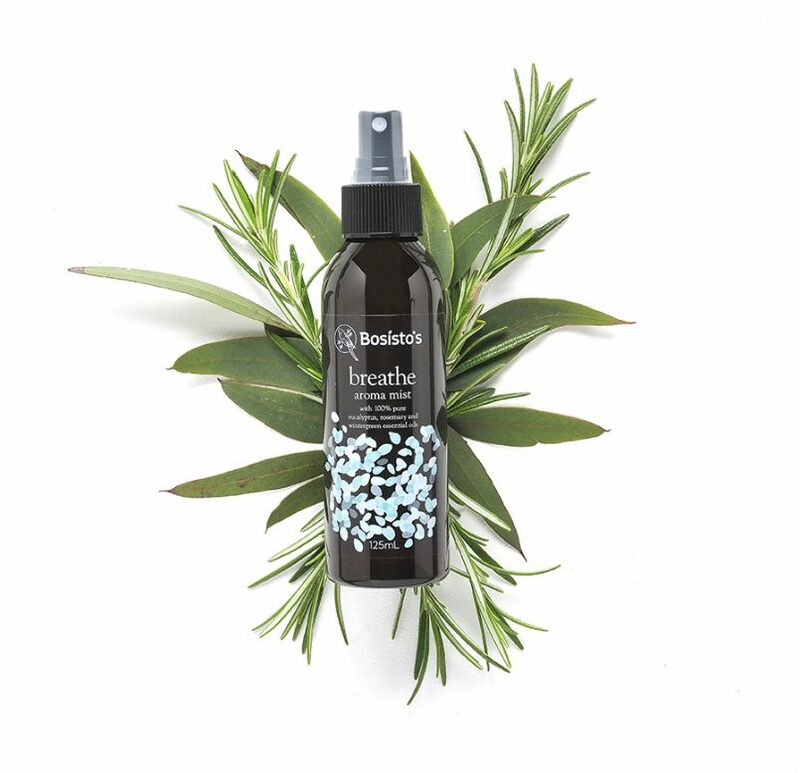 We already LOVE the sleep spray but since we are about to live in a caravan as we do a lap of Australia, I think the Breathe spray will be a necessity for those times when we are feeling a bit under the weather. Thanks Sonia your review and for the opportunity to win these! All 3 would get used I think. I would start with the Sleep first as we always so busy, rushing around during the day, it’s hard to unwind. This would be a lovely aromatic way to create some calm before bedtime. Definitely sleep for me so I can hopefully stay asleep and for the kids to help wind down. I would like to try all 3 but would especially like to try the sleep spray in my son’s room as he struggles to fall asleep. Sleep. I would use it in the bedroom of course, the bathroom, and my walk in closet. Lavender is my fav!! Oh how brilliant to have something like this available in a conventional shop. I would try the energy one first. I think it would be a good one to have in the office. I’d try the sleep mist first. I am having so much trouble sleeping at the moment and as a result I feel so tired during the day…and cranky! These sound fantastic! I would use the sleep first for my children. My daughter has always had trouble getting to sleep and with a change of school this year my son has also started having difficulty some nights. They look great and I use bosisto’s EO in my home daily! I think the sleep one would be the first one I’d try as my son takes HOURS to go to sleep and, although scented “sleep” soy candles help, in the summer a cooling mist like this seems a much nicer option. I would get ‘sleep’ first because someone very special in my life is having trouble sleeping. Then I would get ‘energy’ because I am a teacher and I need the energy in the afternoon. Then I would get ‘breathe’ to help me feel calm and relaxed. ENERGY -I love the idea of changing up the energy in the room – getting the kids to focus on their homework in the afternoon – and I think it will help me ‘get going’ when the ‘To Do List’ is calling! I would love to try Energy. I’m currently studying with a toddler in tow so I need all the energy I can get ? I would love to try Energy. I’m currently studying with a toddler in tow so I need all the energy I can get! ? I would definately get straight into using the sleep spray to help get the kids to calm down and go to sleep, so they can get up in the morning. And i could probably do with some energy spray to get me though the bedtime routine too! Most certainly going to try the sleep mist first in my son’s room. Anything to help him wind down after a big day at school and drift off to sleep easily – would be like magic! Sleep so I can be more relaxed at bed time. I would be using the SLEEP one first – in my room and my kids. I might give these a try, I use a lot of Bositos’ products – like their laundry detergent and eucalyptus spray – and I love them. Thanks NNAM ?? ‘Sleep’ – great night’s sleep sounds wonderful! BREATHE – Sounds great to refresh or purify the air after having the house closed up all day or after vacuuming etc. And especially for when little ones (or big ones!) get nasally at night towards the cooler months! Thank-you! I love the sound of Sleep – something to help unwind and settle down when I’m still thinking of all the things I didn’t get done today or what I have to do tomorrow. Sleep, sleep and more sleep. With an almost one year old who hasn’t really slept well during the night or day I’m so sleep deprived from the last few months especially with only 3-4 hours of broken sleep most nights I’m a mombie (mix of a mum and zombie ?‍♂️). Plus my big two kids could do with some sleep assistance as well ? spray will be much better than another cup of coffee! Sleep!! I haven’t slept a night uninterrupted in two years thanks to my beautiful little toddler.. Bring a single mum, I’d love a little rest! Energy! For my long days at work that follow my long nights at home feeding my toddler more than when she was a newborn – a bit of an energy boost at work would be great! It would be a tough call between Energy and Breathe but I think I would have to go for Energy first to spray in the room when I am studying. Going to check out the breathe first as my allergies are causing insane asthma at the moment! But they all sound ah-mazing! These sound divine! I would use them ALL but particularly the Energy one to help with morning wake-ups and would be great for my early morning yoga classes. Sleep would definitely be used to help my 5 yo at bedtime too ? Sleep first to give to friend’s son who has trouble sleeping at night due to anxiety …and energy on the home front to aid on humid days after restless hot sydney nights! The sleep must for the kids, energy for me ? The sleep mist as I will try anything to try and get a good nights sleep. Can never seem to relax as bedtime. Would love to try ENERGY. We could all do with a little extra and I love the sound of rosemary in it. These look great! I would definitely try Energy first! My 2 favourite oils are lemon & peppermint and adding the rosemary should work well to get my kids up & out the door in time for school!! I would use the Breathe spray to help support my 2 kids who already have stuffy heads and it’s only week 2 of the term! Anything to help them get a good restful sleep. Sleep – to help my kids sleep better! As I guess is the case with most mums, it would be a toss up between the Sleep and Energy blends…, the Sleep to help my littlies sleep well at night, and the Energy blend for myself, for when they don’t! The Energy blend would be my go-to in the mornings. A few sprays in the bathroom/shower while I get ready for uni in the early morning to help get me energised for a big day of lectures and clinics. Sleep and Breathe will definitely come in handy for my toddler when she’s overtired or unwell. We could definitely do with the sleep mist here at the moment. My daughter is having a bit of a rough time dealing with some fears at the moment and we are all missing out on our much needed sleep! Although it would be hard to choose, given I have a basket of ironing I have been putting off doing and need ‘Energy’ to even get the ironing board out; I think I would use ‘Sleep” first. I have been trying to perfect a sleep spray that doesnt increase the risk of vivid nightmares. Bosisto’s could be the answer. The sleep mist I would start with to help calm down my children and me at night. I think I would use them all. Energy for the mornings and breathe when I say it to myself when the kids are testing me. I think I would try the Breathe one in the bedrooms to help the little ones with asthma during the night and spray the sleep one in the foyer to settle them after school. ? Definitely using energy first as the recovery spray after minding rbe little grandchildren…such fun. Such tiredness. My 3 year old daughter would just love to try the Sleep Spray! The lavender would really help her settle down & relax after a busy day Care day. ? I would use the Bosisto’s Energy spray. I need it to get up and go. I have misplaced mine. Love the rosemary, lemon and peppermint of ENERGY. I bought some for my bathroom but use it everwhere -so uplifting. I would love to try “Energy” first for the afternoon slump at work to give me a burst of energy so I can refocus and feel motivated. Breathe- Have always love the smells of eucalyptus. A great scent to kickstart my day! I have the breathe mist which my daughter uses to help her as she suffers from anxiety, it helps her to calm down. I would also love to try the energy mist to give me that boost in the morning. I would definitely use the Sleep Mist first. I’ve reached the peri-menopause stage and have discovered that insomnia is not fun at all. Definitely energy. With 9 children to run around after, I need all the energy I can get. They certainly keep me on my toes. Definitely Energy. Anything with peppermint in it is a winner in our household. I would use sleep first as my 8 year old son finds it very difficult to get to sleep. He is an over thinker & hopefully this will help him relax & get a good night sleep. I’d love to be able to have a good nights sleep. Seems ages since i have, so the SLEEP mist is definitely the one for me. Definitely Sleep with Lavender & Camomile!! A few quick sprays in the kids rooms before bedtime to promote relaxing sleep! I would use SLEEP so that I can enjoy a sound sleep and wake up feeling rested and restored. Definitely the SLEEP mist!!! Everyone in my house are light sleepers and my preppie has never slept well in his whole 5 years!! I would definitely use the “Energy” Mist Spray first in our homeschool – especially on hot days, followed by the ‘Sleep” Mist Spray so they can get a good nights sleep ready for a new day of school! My goodness! Being 7 months pregnant I would use all of them but the sleep one would be perfect ❤️ Am just getting into essential oils and have found them super helpful (particularly for grinding my jaw at night)! I would love to try the sleep mist, as I’m in desperate need of a relaxing night sleep. Love the sound of them all I’d try BREATHE first since I have an ongoing lung problem which needs all the help it can get. However I prefer natural remedies over medication so would love to see how much this might help alleviate my symptoms. Great Australian company. Have been using their washing powder and eucalyptus oil and spray for years. I would definitely try ‘sleep’ first. But not for kids. I want it for me!! I love Bosisto’s Eucalyptus so it has to be “Breathe”. I think spraying the lounges with this would help prevent a few allergen breathing problems as we approach the Autumn. Need to Breathe some fresh air and the Breathe Aroma Mist sounds ideal.